Both sexes: Small, brown finch with red forehead and black bib. The Lesser Redpoll is a small, dumpy bird whose upperparts are grey-brown with darker streaks. They have two buff coloured wing bars, dark streaks on the whitish flanks and a dark brown forked tail. However, the most distinguishing features are the red forehead and black bib. In the summer, the cheeks, throat, breast and rump of the males are pink. The females are similar to the males, except in the summer they are duller and rarely have any pink in the plumage. Redpoll is one of the species that ornithologists do not seem able to decide on whether there are several species, subspecies or races. To skirt around this issue, I refer to them as "types". The predominant British type is the Lesser Redpoll (C. cabaret), which is described in more detail above. The north European type is the Common 'Mealy' Redpoll (C. flammea), which is a winter visitor and is larger (about same size as a Linnet) and greyer looking than the Lesser Redpoll. The third type is the 'Greenland Redpoll' (C. rostrata), which is another winter visitor and is larger than the Common Redpoll and darker than the Lesser Redpoll. The final type is the Arctic Redpoll (C. hornemanni), which is a rare vagrant from Greenland and Lapland and is slightly larger than the 'Greenland Redpoll' and has a white rump and underparts. In older texts, the Latin names for the Lesser and Greenland Redpolls will be C. flammea caberet and C. flammea rostrata, because they were regarded as races or subspecies rather than species in their own right. Twite are another potential confusion species. They are quite scarce in most parts of the UK apart from the Pennines and Scotland in the breeding season and coastal areas in the winter. Like the Redpoll, they are a small finch with streaky brown plumage and pale bill, but lack the red forehead. In breeding plumage, the male Twite has a pink rump. The call of the Twite is similar to that of the Linnet. The call is a metallic, rattling series of notes: "chuch-uch-uch-errrrr". 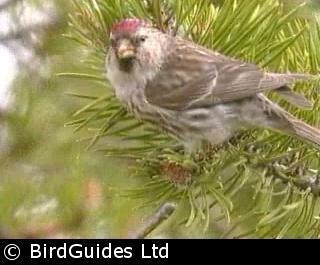 Redpoll feed usually feed among the branches of trees where they are quite nimble and can hang upside-down. They feed on very small seeds, like alders, spruce, and birch. During the breeding season they also feed on insects. The female builds the nest in a tree or bush, usually in birch scrub or mixed conifer and birch woodland. The nest is a small untidy cup of fine twigs and grass, lined with feathers and hair. The smooth, glossy eggs are pale blue with pale pink or lilac markings, and about 17 mm by 13 mm. Incubation is by the female only. The young are fed by both parents. British Lesser Redpolls are mostly resident but some migrate. For example, birds in northern Britain migrate southwards for the winter and some even reach mainland Europe (e.g. Netherlands, France and Italy). Today, the Lesser Redpoll population is about one-tenth of what it was in the 1970s and yet this delightful little bird has only recently been moved to the Red List of species of conservation concern.